The death of Brian Sinclair, a 45 year old man who died of preventable sepsis in the emergency room of the Winnipeg Health Sciences Centre without being properly triaged, 34 hours after he arrived there by referral for treatment of a urinary tract infection. Tragic and preventable negative health impacts occur at the intersection of social exclusion, complex illnesses (including multi-generational trauma), and largely unintentional relational or attitudinal racism has recently gained increased attention. 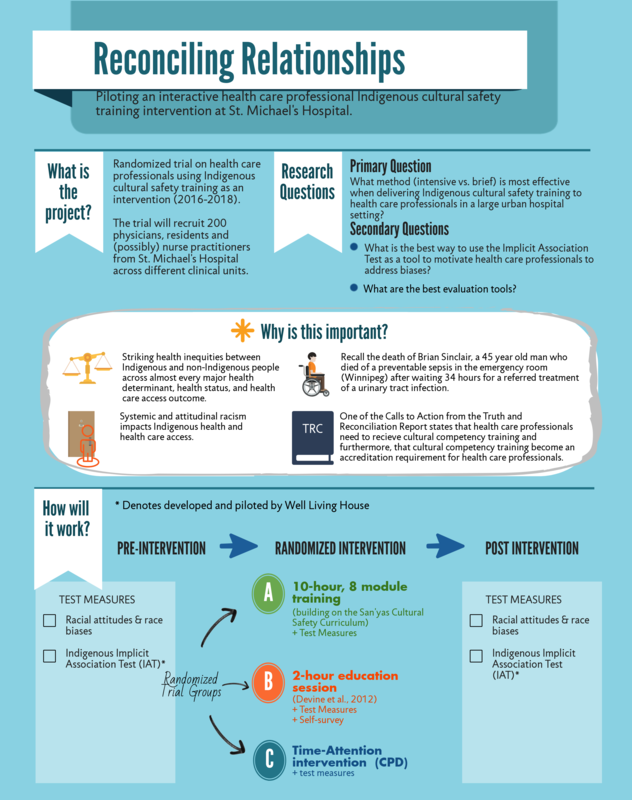 Our review of the history and ongoing impacts of both systemic and attitudinal racism on Indigenous health and health care access in Canada more generally, identify health care professionals (HCPs) – Indigenous patient relationship as a critical, necessary, and promising juncture for intervention. This project draws on the HCP education and social psychology literature documenting and addressing race preference bias, a bias that is linked to differential treatment. It is also well aligned with the Truth and Reconciliation Commission’s recently released recommendation that all HCPs receive cultural competency training and the emergence of cultural competency training as an accreditation requirement by HCP training bodies (including the Royal College of Physicians and Surgeons and the College of Family Physicians in Canada). Findings from this pilot project will be used to then evaluate the feasibility, acceptability, and preliminary effectiveness of an educational race bias intervention for HCPs. An educational race bias intervention aims to motivate HCPs to use bias reduction strategies by increasing their self-awareness of their race preference biases using a new Indigenous race preference tool called Implicit Association Testing (IAT) and enhancing their concern regarding the potential negative impacts of their race preference biases by sharing information regarding the harmful impacts of bias including links to differential decision making in health care contexts. Our primary research question is: What is the optimal method for Indigenous race bias education for HCPs to run this type of education with HCPs at SMH? Our secondary research questions are: What is the best way to use the IAT as a tool to motivate HCPs to engage in strategies to reduce their own implicit race preference biases? What are the best evaluation tools for assessing race bias changes? We proposed a randomized trial involving 200 multi-disciplinary staff members (e.g. physicians, nurses, clerks, students) of St. Michael’s Hospital across different clinical units (e.g. family medicine, emergency medicine).